The Test and ODI legs of Pakistan’s tour of South Africa are done and dusted. Both the series went in the favor of the hosts. It’s time now for the shortest format of the game. The first of the 3 T20s will be hosted by the Newlands, Cape Town. Keep reading to find out South Africa vs Pakistan 1st T20 Match Prediction. While South Africa inflicted a clean sweep in Tests, they won the ODI series 3-2. The scoreline of the ODI series doesn’t reflect the kind of fight Pakistan had put up. They were dominant until the 4th ODI and had a great chance to win the series. But the hosts pulled up their socks in the last game to clinch the series. But now the format changes and so do the chances of a series win for the Men in Green. Pakistan sn the No.1 ranked side in the world in T20 Internationals. They have had a tremendous run in the format as they have won 9 back to back series. When the format becomes the shortest, team Pakistan becomes the most dangerous. 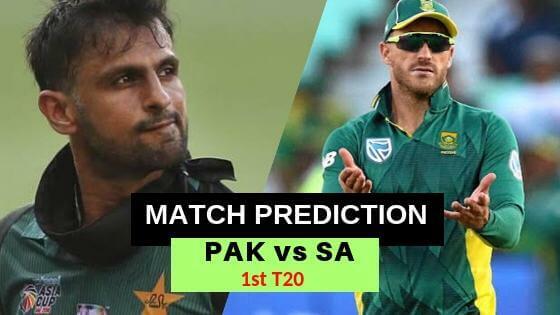 South Africa vs Pakistan 1st T20 Match Prediction: The visitors, despite putting in good performances, lost the ODI series. But it’s their best chance to win a series in the shortest format of the game where they have been flourishing of late.